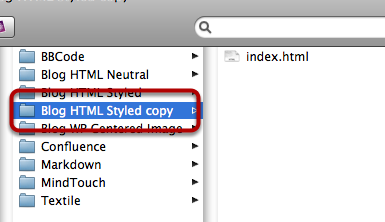 Open your preferences window and select HTML Templates > Blog. 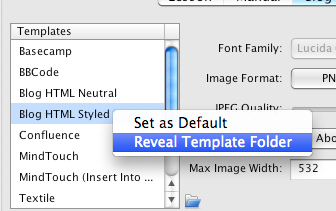 Right click on the template you want to edit and select Reveal Template Folder. Duplicate the folder and rename it. Here I have renamed the folder to "My Blog Template". 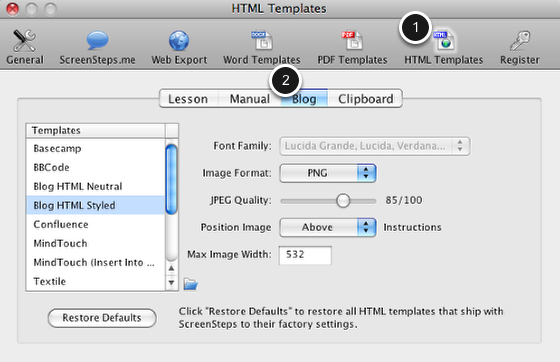 If you look for the [-- START STEP TITLE --] section you will see the formatting that will be used for the step title. The default is an h3 tag but you can change this to any tag you would like. The only part you need to keep is the %Title% string (that is where the title gets inserted. That would give me an h3 tag that is orange, italic, not bold and 14 pixels in size. 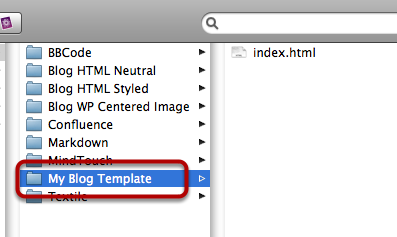 Now just save the file and use it the next time you want to upload a post to your blog. Prev: How Do I Add An Image Border When Exporting To Blog?